2017 kicked off with the Star Academy successfully hosting the Challenging Children Conference. Jenna white presented on ABA and the effectiveness of an ABA program as a treatment solution. We also had the privilege of learning from one of the world’s leading experts in biomedical treatment, Dr Anju Usman who shared published research and insight into the biomedical treatment protocol and the latest medical treatments. Many parents and professionals walked away with new hope and inspiration to tackle the challenges associated with autism or a related disorder which left untreated can be debilitating. Biomedical treatment and a good quality and intensive ABA program go hand in hand. When the child is healthy and free of underlying medical illness they can learn and catch up their delays. Autism is marked by skills deficits and behavioral excesses. Once we teach the children the skills they are deficit in we find that the behavioral excesses decrease. Inappropriate behavior can be replaced by teaching an appropriate means of communication. 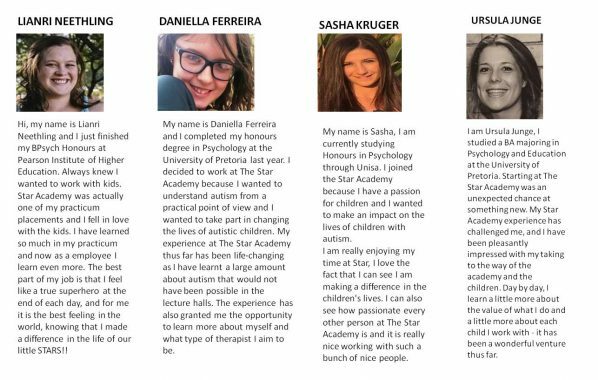 At the star academy, an academy proudly affiliated to CARD based in the USA and world leaders in autism treatment we focus on teaching children skills. Our dedicated team of Board Certified Autism Technicians work one-on-one with the children implementing a tailored made program specific to each child. For some children the goal is independence and functionality and for others recovery and mainstream school. Its back to school and the holidays have become a memory of the past. Our team have returned from the break refreshed and eager to get back to working with the children. 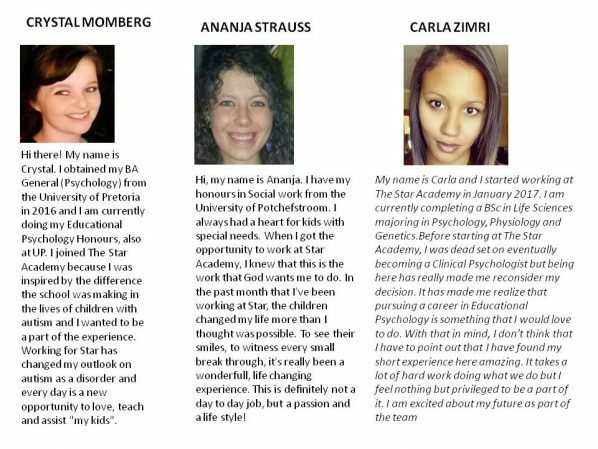 We have numerous new faces who have joined our teams in Johannesburg and Pretoria full of energy and determination. We look forward to a successful and meaningful year with much progress for the children. From the Star Academy Team we are committed to your child’s progress and will leave no stone unturned to ensure a successful year. 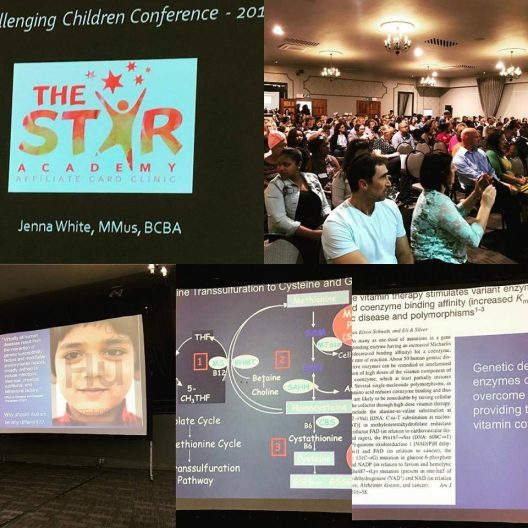 On 22 January 2017, The Star Academy, leaders and experts in autism treatment, hosted the 2017 Challenging Children Conference. The conference focused on autism solutions and treatment for children with learning challenges, including ADHD, aiming to provide strategic assistance for any child experiencing difficulties in one or more of the following areas: academics, attention, socialization, language, sleep, nutrition, general health and wellbeing, perspective-taking, self-control and self-monitoring, planning, organization, motor skills, play skills or behaviour. 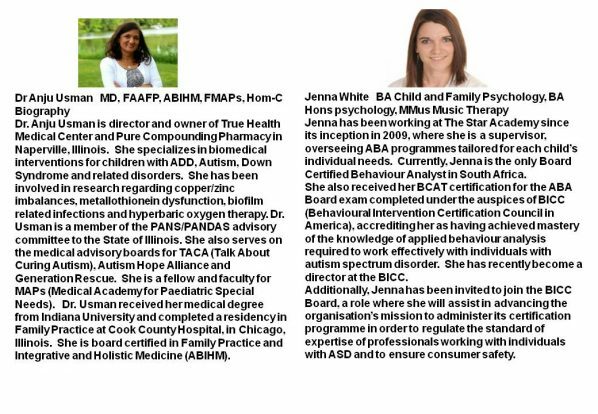 Dr Anju Usman addressed the underlying medical conditions causing the autism symptoms and discussed treatments and Jenna White presented on how Applied Behaviour Analysis (ABA) can address the skills deficits and treat autism. Through the application of the principles of behaviour analysis the Star Academy team delivers a unique program for each child aimed at addressing each child’s challenges and delays. Many decades of research have empirically proven the effectiveness of ABA with children with Autism Spectrum Disorder (ASD). Furthermore, ABA is advocated by the American Surgeon General in the treatment of children with Autism. The conference catered for parents, regular education teachers, special education teachers, speech therapists, occupational therapists, educational psychologists, doctors, and any other relative or professional who interacts with children with Autism, ADHD, behavioural challenges, or learning challenges. Significant insights into assisting children with these conditions and the various empirical interventions which are available both from a medical and behavioural perspective were covered at the Conference. 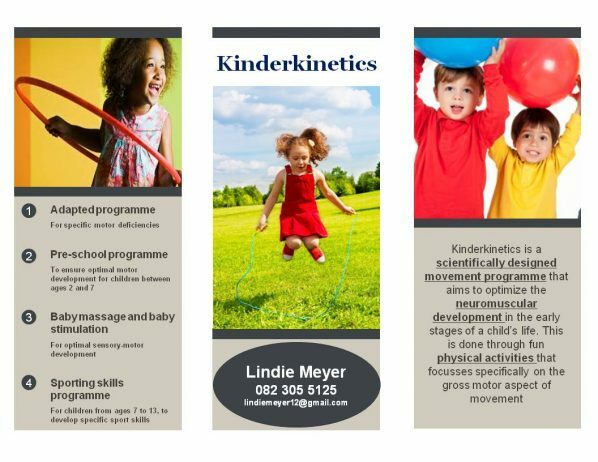 With a focus on providing skills through educational and behavioural instruction, complimented with the relevant medical intervention, challenging children can be assisted to overcome their challenges. The aim of the Conference was to provide a message of hope and to empower parents with information in order for them to understand the various treatment options. The conference provided attendees the opportunity to engage with cutting edge information on the latest medical and behavioural interventions available to children with Challenges. If you would like a copy of the DVD please contact us on 011 440 7796. Welcome to cayla strauss who has joined our Star Academy Team in our Admin office. Cayla studied and achieved her certification in entrepreneurship through the University of Cape Town in 2015. She is currently studying towards her Bcom Degree through Milpark Business School and is working for us full time as Ilana’s personal assistant. 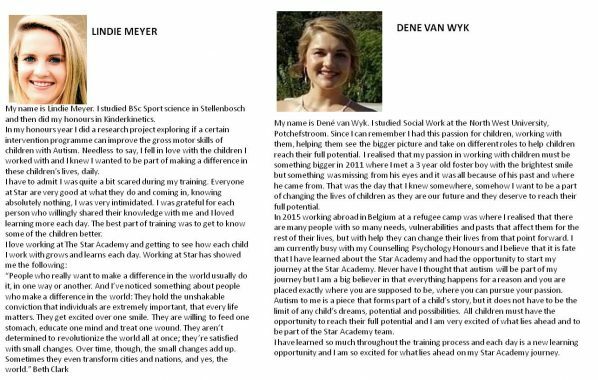 In the few months that she has been working for Star she has excelled in joining our team and feels inspired to be working at Star academy. Every day presents a new challenge and therefore she feels very fulfilled working towards the goal of improving the lives of children with autism. Her energy, enthusiasm and skill set is a valuable asset to Star Academy and we are excited to have her on board. Children with autism are the yellow canaries of our world, sending us a very important message. 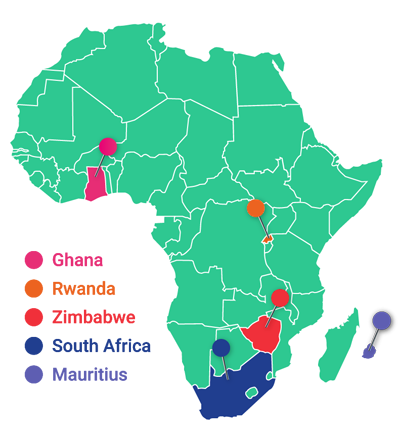 The message is that our world is simply too toxic, increasing both local and global prevalence of the condition. Imagine losing your perfectly normal looking baby to a condition called autism which can be a debilitating diagnosis left untreated. Autism could mean that a child is lacking in the basic skills to function as a human being. It could mean that your child can’t speak, can’t sleep, struggles to eat, won’t go to school or have friends or lead an independent life. Often these children engage in severe aggressive behaviour as they have no way of communicating their frustration and the pain they experience in their inflamed bodies. They are trapped unable to communicate their needs and feelings. Can you imagine not being able to speak for even just one day? 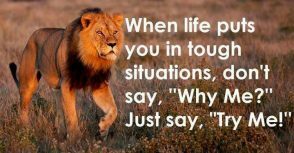 How would you communicate that you are hungry or thirsty or that you feel sick or sore? For parents who don’t know how to treat autism or don’t have the finances to give their children the much needed medical and educational intervention it means fear and despair. It means a living hell! When I learnt of parents in Thembisa giving up their food portion for the day to pay for transport to bring their autistic child to the Thembisa Hospital for speech therapy I knew I had to act immediately to help them. 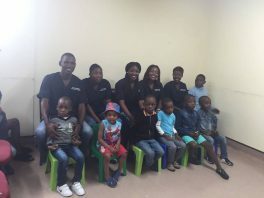 The Star Academy which is a public benefit organisation and a company not for profit has started the Thembisa Outreach Programme to assist children with autism in this poverty stricken township. Through our team’s deep commitment, we have trained residents in Thembisa in our Star Academy teaching methodology to uplift the lives of both parents and their children. Help us change the course of autism for these children and their families. We need your help to teach them the basic skills to function as human beings. In South Africa there are no government grants or medical insurance to alleviate their suffering. Help us give these children a voice by unclipping their wings, so that they can have the chance to fly as high as they are able to go.